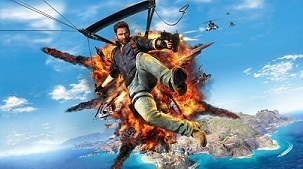 In Just Cause 3, you are a rebel agent who wants to put an end to cooperation with allies of the reign of terror of dictator and General Di Ravello. The General has the settlements, provinces and regions of the playable Mediterranean island Medici. And your task is to liberate the regions and provinces. Here you have a large arsenal of weapons and vehicles and even you can drive Formula 1 car. In our guide to Just Cause 3, we show you how you can liberate the settlements and what areas are there. At the beginning of the game and after you've got a new grappling hook, you should go directly to liberate your first settlement. Symbols that represent different objects now appear on your map. You must destroy them and the number of objects also varies depending on the area. 1. Insula Fonte (9 provinces, 39 settlements) : This area is focused on agriculture and therefore, you can find a large number of fields. 2. Insula Dracon (7 provinces, 33 settlements): This are is focused on oil production and therefore many winding towers. 3. Insula Striate (13 provinces, 58 settlements): Here you will find Di Ravello property and Bavarium mines. Your main goal is to liberate all three regions. To do this, you must, however liberate 29 provinces and 130 settlements. Generally speaking, you have to simply destroy all the chaos objects that you see in icon in the top left on your screen. If you open the map, you'll get even more detailed information about your targets. To find out the locations of the respective objects, you have to destroy one of them. Right after that you will be shown on the map where the other objects of the settlement are hidden. Only if you have destroyed all the chaos objects of a settlement, then this place is considered exempt. - It is easy to destroy the chaos objects with rocket launchers, but since you only have a limited amount of ammunition, you should primarily rely on your grappling hook. - Red is hostile and blue is friendly - destroyed red marked objects on the map. These are the Chaos objects that must be destroyed in order to liberate a settlement. - You can easily destroy fuel tanks using your firearms. Stay tuned, however, at a safe distance, because you blast radius is enormous. - Whenever you have cleaned the area and dedicate yourselves to the destruction of chaos objects, new enemies will come to defend this. - Do you want to liberate a base, first open the door, so you can help the rebels? For larger bases, it is useful to attack the missile area first.